A run doesn’t have a set value. That is a recurring theme of this website. The value of a run derives from the game in which it is scored and in all honesty can only accurately be gauged with hindsight. Up until the moment a match is finally decided, all we are doing is gathering evidence and sharpening the picture. Yesterday, in the first one-day international against India, England whopped a load of sixes at the end. They hit one in the 22nd over and then three more before the 43rd over, before flapping, blamming and punting seven more from then on. This seems pretty normal. For all that one-day cricket has changed, it’s still not the worst strategy to build some sort of a base before taking more and more risks as the innings wears on. However, the more sixes they hit in this late period, the more we became utterly convinced that India would win the game. It was almost as if every six was worth minus six. As mishits and flat skimmers cleared the ropes, the value of a ‘maximum’ – and therefore the value of a run – became clearer. Each six seemed to bring with it the shadow of two others that hadn’t been hit earlier on. In contrast, India had hit 10 sixes by the end of the 38th over. They knew they were there to be had. Even at its farthest extreme, cricket is never exactly ‘most sixes wins’ – but it is still an indicator; a signal as to how easy it might be to score runs on any given day. The brilliance of Virat Kohli and Kedar Jadhav was obvious and flaws in the touring side’s defence can also be found. 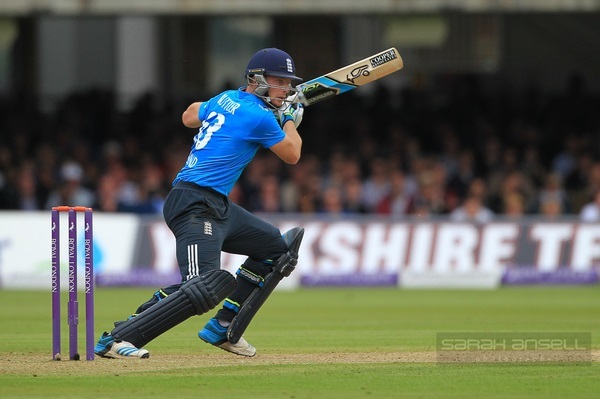 But given their chance again, maybe the England batsmen would – in more ways than one – have aimed higher. The first real problem with this way of playing (which is obviously still about a billion times better than the old way) might be starting to show itself. At the start, England scoring 350 probably melted the minds of the opposition and was sufficient to win at a canter. Now, there must be a feeling that all the extra runs the batsmen score can be dragged back by all the runs the bowlers concede when England bat first. As an aside, I can’t believe the “deep 5th slip” fielding position hasn’t been utilised in ODI cricket yet. Some of the sixes were amazing, but every good ball seemed to be nudged down to 3rd man for an easy single. Keep 3rd man in still, but I cant understand why teams just let this happen when the steer is a second-nature to batsmen as a forward defensive was 20 years ago. That may well be the reason why Kohli chose to chase after winning the toss and reject the conventional wisdom in India to bat first in ODIs. On a pitch where run scoring is that easy, it may be more advantageous to have a set target to chase rather than bat first and try to assess what would be a good score. Especially if you’re as good as Kohli in a run chase. From an Indian perspective, it’s interesting that Kohlis captaincy approach seems to be based on his own batting strengths. Dhoni would probably have chosen to bat first. So outsource the par score calculation, basically. Excellent points by Uday, I would also add that when batting first you are taking a risk if you try to push the pace early before seeing exactly how the conditions are panning out. Hindsight is 20/20 but had England hit a lot of sixes only to lose cheap wickets and be bowled out for a low total they would have been excoriated in the press for being irresponsible. From the players perspective even when batting conditions are ‘easy’ there is still self imposed pressure on them to get it right*. *Unless you are an enormously talented spud like David Warner who will attempt to heave the ball out of the park from the outset regardless of conditions. Agree with the above points about pacing an innings despite the ease of the pitch. But the other point is that England did keep losing wickets at inopportune times. Not one really big innings. Not one really big partnership. As with test matches out there, it is usually one of those “big-big” jobbies that seals the deal. I think we need to entertain the possibility that the best team at playing in those conditions won the match. We can, at the moment, also entertain the possibility that England is one of the best ODI sides in the world. Only in those subcontinental conditions does England look second or third best just now. Sunday’s loss did not leave me feeling gloomy in the way that, until recently, England’s ODI losses seemed almost inevitable and the result of England really not being up to the job in that format. Progress but not perfection. Glen Chapple Lancashire Head Coach news reactions, anyone? The news, surely, is that his job title isn’t player-coach. 985 FC wickets. Getting that close to a record like that and then retiring really irritates me. Just let him play a few games this season for God sakes. “Your team’s late barrage of sixes is bad news for them” – proof that Yer Maj is a Bayesian. Top stuff. For once I wrote a grown up comment on this site yesterday – see above. Come the morning, the Chinese beauties have gone, only to be replaced by a scarily-wide-eyed blond “mature dating” offer. I don’t feel very well any more, this morning. If it cheers you up Ged, I’m getting utility bill discounts. I’m getting 5 reasons why i might have fatty liver. This may explain why ad revenue isn’t what it once was.